To embrace the LEAP (Leadership. Education. Achievement. Personal Growth.) Be. Know. Do. criteria and realize the impact that the below five practices can have on the development of student leadership, LEAP has been integrated into each TSA competition as part of the official rules and rubrics. The topic will be available to contestants at registration desk at 8 a.m. April 4, 2019. Please note that contest supplies will NOT be provided for both the middle and high school's structural or problem solving contests. Suggested and required materials are listed in Total TSA (High School or Middle School) within the competitive event guidelines. The Tennessee TSA online submission form will be used for sending a url link to a student's project. Contestants will submit hard copies of either their LEAP resume, and/or additional required project documentation onsite at event check-in. Please note that instructions for early submission events on tsaweb.org is ONLY for the national conference contests. Tennessee TSA will hold the VEX Robotics Competition on both the middle and high school level at the Tennessee TSA State Conference. All teams must be officially registered with through robotevents.com by March 1, 2019, and with the TSA state conference registration by March 4, 2019, in order to compete at the Tennessee TSA State Conference and TSA National Conference. The Tennessee TSA Robotevents.com registration will also be open on February 5, 2019 and will close March 1, 2019. Click the link for the VEX VRC inspection checklist. Update: We are now allowing advisors to enter up to three teams per chapter at state event. If the VEX state contest team count exceeds the maximum capacity for our facility space, the TSA state advisor will notify the chapter advisors as soon as this occurs, and entries will be reduced to two teams per chapter. Please note advisors with three teams, you should clearly communicate with the members of your "third" team that they will be considered an alternate team until registration has closed. If we must reduce numbers to two teams per chapter, advisors will have an option for the third team to be entered in another state event. Advisors with VEX teams entered will receive a team verification form to ensure accurate registration has been completed and accepted by Tennessee TSA on March 6, 2019. Please note that TSA allows 2 to 6 members per VEX team. When registering your students for state in VEX please be sure your teams are separated appropriately when assigning a team number for your chapter. The team from the example above has entered a total of two teams. Team #1 has 2 members, and team #2 has 3 members registered. This chapter is eligible to bring two robots in the VRC competition. The team numbers above indicate the members of each team. 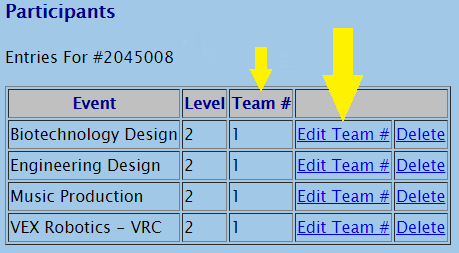 To edit your student's team number you must select the event entries link to right of their name, and you will then be able to select edit team # option featured in screenshot below.